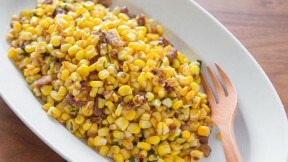 Shuck the corn, remove any silk clinging to the cob and then cut the kernels off the cob with a sharp knife. Break up the kernels with your fingers so there are are no large chunks remaining. Saute the shallots and bacon over medium high heat until the shallots are browned and some fat has rendered out of the bacon. Add the corn and saute until the corn is cooked through (it will go from opaque to slightly translucent). Add the nutmeg salt, and basil and toss to distribute evenly. Add the apple cider vinegar and toss to coat. Serve warm.